Welcome to our challenge this week at Stamp Ink Paper. 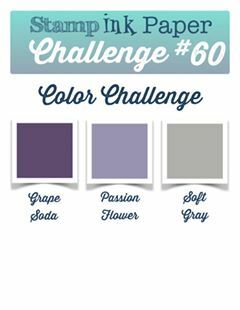 Today we have a colour challenge for you, with colours chosen by Andrea. I've had some technical issues this week and wasn't sure I would get a card up in time posted, but I went ahead and made it in any case. I'm glad I did, because it contains a couple of my favourite things in both colours and a Butterfly. Come and see. So I used Stampin Up colours Elegant Eggplant, Smoky Slate, Wisteria wonder and some Whisper White cardstock for stamping my main image. The Stamp set I chose was You've got This which I combined with Papillon Potpourri butterfly and sentiment from the Guy Greetings stamps. I kept it very CAS. I had some purple rhinestones in my stash which I added to this card and I used my Wink of Stella on the flower centre. A closeup of the greeting is in the bottom picture. We hope you will join us at Stamp Ink Paper. Those design team cards all look so pretty and we can't wait to see your creations. Beautiful card with the challenge colors. The butterfly adds a special touch.